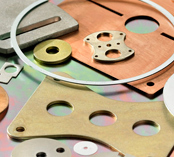 Spacer Plates | Boker's, Inc.
Boker's is a metal stamping manufacturer of custom spacer plates. Spacer plates are used to provide space between two or more components. Boker’s provides custom spacer plates in a variety of shapes and sizes up to 12” x 12” (flat) with thicknesses from .005" to .190".